“Whatever doesn’t kill you makes you stronger.” Sounds catchy, in an oversimplifying way, and subtly seems to offer stress-reduction and stress-rationalization to tenacious job hunters who can’t find jobs, job hunters who found a job and now hate it, head hunters who can’t find the right candidate and recruiters who found the wrong one or can’t find the time or the way to find another. The problem is the German philosopher Nietzsche’s equivalent T-shirt catchphrase simply isn’t, as stated, true, however “inspirational” or insightful it sounds. For starters, it’s like saying, “Music that doesn’t kill your interest will make your musical interest stronger.” No, it may leave your musical interest unchanged, as unnoticed elevator and escalator Muzak usually does. Or, “Surgery that doesn’t kill you makes you stronger”—here, definitely not true if it means “always physically stronger” and only sometimes true if it means “emotionally stronger”. Sometimes, all that cosmetic surgery augments is a body part or two and a tendency to vanity. Put this way, the “…doesn’t kill….makes stronger” notion sounds very peculiar or at least suspect. It’s certainly not true that “stress that doesn’t kill you makes you stronger”—which, by the way, seems to be what motivates much of the need for and adoption of Nietzsche’s dictum. Stressors, as causes of stress responses, come in many forms: a seemingly endless meeting, a market or car crash, a demanding manager, a traffic jam, unpaid bills, a dead-end job or no job. These and other uncountable stressors lead to one or more of a much smaller set of feelings—such as exhaustion, pressure, irritation, which are the effects of the traffic jams, unpaid bills and the like. The point here is that what doesn’t kill you—whether it be one or more of the countless possible stressors in life or one of the few possible stress reactions—won’t necessarily make you stronger. Instead, it may make you weaker, sicker or just plain chronically miserable—like Nietzsche, who was ill for most of his adult life and died after a prolonged bout of insanity, which probably neither killed him nor made him stronger. To see through Nietzsche’s overused motto and to illustrate how, in the realm of job-related stress, what doesn’t kill you can make you weaker, just ask this question: Why is chronic stress associated with hardening of the arteries, which may impair your cognitive and other physiologically-based performance well before it gets a chance to kill you, if it indeed ever does snuff you? In his delightfully titled, but rigorously argued and researched book Why Zebras Don’t Get Ulcers, Stanford University professor and researcher, Robert Sapolsky explains: Hardening of the arteries (of the kind caused or exacerbated by the sorts of stressors and stress responses that almost anyone reading this article is likely to experience to some degree) is actually the result of a good process that simply gets over-activated and overdone. Under transient, temporary stress, your blood vessels will stiffen as part of a process that increases the velocity of blood flow. This gets urgently needed increased volumes of oxygen-rich blood to to the parts of your body that facilitate responses such as fight or flight. This stiffening response is a key process in responding to emergencies, such as threats, and will, during an emergency, make you stronger at that moment. So when you are racing to get to a client or recruiter’s office, chances are your arteries are stiffening to facilitate your run, vigilance, etc. That problem is that the same process, viz., arterial stiffening, that is making you stronger during and for an emergency, can, if it continues indefinitely under conditions of chronic stress, such as chronic anger, anxiety, vigilance, frustration or fear, become excessive and morph into permanent hardening, rather than temporary stiffening of the arteries—a bit like a McDonald’s employee stiff “have-a-nice-day” smile that never quits. If Nietzsche knew this about arterial stiffening he might have reformulated his aphorism as, “Whatever makes you stronger in the short term may kill you in the long.” Or, “Whatever doesn’t kill you now may weaken you until it does kill you.”—e.g., arteriosclerosis. As a false motto, his original “That which does not kill us makes us stronger” is on a par with “no pain, no gain”, which is equally flawed, since the latter completely overlooks the categories of effort that are both pleasurable and productive, such as a fitness-promoting walk with your beloved, frisky dog through a forest, or a seal-the-deal meeting with a key client who has a great sense of humor that makes you laugh all the way to the bank. As for the “doesn’t-kill-you-makes-you-stronger” notion, chronic stress usually does neither in many, if not most instances. The only ways Nietzsche’s bumper sticker could be true would be if it were interpreted to mean “What doesn’t kill you makes you stronger than a dead person”, or “What doesn’t kill you makes you stronger than at least one other weaker person”, or “What doesn’t kill you sometimes makes you stronger”—which, unlike the false original maxim is true, but only trivially, obviously so. If you have some other snappy stress-management mantra or other motto on your desk or in your head to trot out in an interview, bear in mind the following philosophical maxim from 20th-century Anglo-American analytical philosophy, which seems to fall into neither of the categories it describes: “What you are saying is either false or trivially true.” Both Nietzsche’s and Ben Franklin’s stress-focused maxims just cited are false, if taken literally. Although a case can be made for the wisdom of Franklin’s aphorism, if it is taken in the spirit of the tax-related musings in which it was embedded, e.g., as an eternal truth about capital gains, other income and taxes, viz., “There are no gains without pain”. 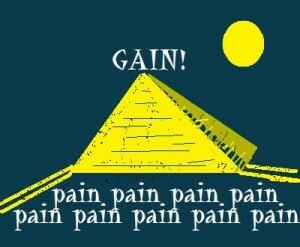 Otherwise, the only way they can be true is to interpret it in a trivial way: “No pain, no gain” becomes “All effort has a cost” or “Sometimes, no pain, no gain”—which although true, at least from the caloric and body-building standpoint, are only obviously, undramatically and trivially so. Chances are that your own desk-displayed stress-management mantra-motto is flawed in exactly the same way. That’s why mottos are, on the one hand so interesting, viz., because they say something highly unexpected (i.e., probably false), yet, on the other hand,t somehow clearly true (because of the concealed trivial interpretation). Note: This ambiguity is the key to many successful advertising campaigns, including in recruitment, e.g., “Are You an IBMer?”—No, since I don’t work for IBM; maybe, if I am what IBM wants; yes, if we want each other. There is, however, one more possibility—that a motto is neither true nor false. For example, there’s the claim that what Nietzsche should have said is, “Whatever doesn’t kill you should be used to make you stronger.” As such, it is neither (trivially) true nor false. It’s just advice—neither true nor false. Maybe good advice, maybe bad, but just advice. If you are, despite all the foregoing caveats, still inclined to motivate your job hunt or job with some kind of stress-reducing/rationalizing or other kind of motto, epigram, aphorism, slogan or catchphrase—like Sly Stallone’s “A man got’ta do what a man got’ta do”*—you really should try to find one better than Nietzsche’s, Stallone’s or Ben Franklin’s/Jane Fonda’s (Fonda having introduced the modern “no pain, no gain” version of the mantra in a 1982 fitness video). Remember: neither false nor only trivially true. That’s what you should be shooting for. Need some help? How about this stress-management motto: “My stress-management motto is false.” At least it’s not trivially true, it’s not false and it’s not merely advice. Because, if it’s true, it’s false; if it’s false, then it’s true. Most definitely, it is not advice.